I will preface this with the fact that I am using an iPad on this trip and it doesn’t have Word on it so I cannot attach anything in a word doument. I will have to just type everything in the email. I hope that is okay. I am in Finland for the next two and a half to three months to teach English to Russian speaking students. They are brought over from Russia on a program that lasts two weeks at a time, so we will be teaching six different sections of kids. Their ages will range anywhere from 8 to 18, and they will get older as the summer goes on. Right now I have a class of 11 and they are all 8 to 11 years old. They are at an elementary level of English. I do speak a little Russian, though I am very rusty, and they don’t always understand my accent. The language barrier can be tough sometimes, but gestures and drawing helps, as do dictionaries. As for my surroundings, Finland is beautiful. Everyone seems to know only about Helsinki, the capitol, but I am about three and a half hours north west of the capitol, in Huitennen at the Lansi-Soumen Opisto. Huitennen looks just like Minnesota, just without all of the hillls as it is very flat here. My first day I walked outside and found Lilacs, which remind me of home because we have them growing in our backyard in St. Paul. It’s very green here, lots of trees, there is a river out behind the school, and the sky is almost always blue. Of all of the places I have traveled, 11 countries in total, this one feels the most like home. There are some differences. The teachers live in the school, our rooms being through the classroom, in the back, behind a little door that always remains locked, and there is a sauna near the river that we can use any time. Class can only last 45 minutes before the kids get ten to fifteen minute breaks. It’s been a while since I was in grade school, so I’m not sure if that is true for the US as well. This school sounds like a fascinating medium for the sharing of language and culture. Despite the initial flurry of unfamiliar languages and cultures, its nice to know that a place can feel like home. It’s amazing that the subtlest of details, like the presence of lilacs, can transform an experience. I wonder if the “feels like home” emotion is what made Minnesota such a comfortable home for so many Scandinavian immigrants. At the local level, my dad lived for several years in Duluth as a child before spending ages 8-22 in South Dakota. After college, he longed to return to a setting similiar to that of Duluth, eventually settling in Northfield, MN. The interesting part of your report is that Finland plays host to a U.S citizen and Russian citizens with one common denominator, learn/teach the English language. I wonder whether these Russian students are part of a program that also is located in the United States or Great Britain. On another note, I find it fascinating that traveling seems mainstream in today’s world. I can’t imagine whether anybody’s bucket list doesn’t include the word, travel. But no matter where life takes us, home is where we all seek within the places we stay. 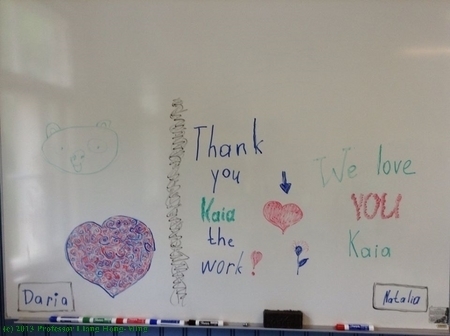 It sounds like your time in Finland has been pretty fantastic, Kaia. No, I do not believe elementary school classrooms necessarily get the same breaks that your students are blessed with. Finland is supposed to have one of the best school systems in the world, and I’d venture to say those breaks contribute to that. I applaud you for maintaining their attention! Your description of the lilacs reminded me of a time when riding my bike around my home neighborhood, I couldn’t pass more than three houses without passing a lilac bush. My house in St. Paul has lilacs growing on both sides, which not only are beautiful in the spring but also serve as the good fences that make good neighbors. Having a language barrier usually is seen as a problem, however I have had that a couple of times in my life and still we found a way to communicate. In the end it ends up being extremely fun, but sometimes frustrating. It is very interesting that the teachers stay at the school. Does it feel different or awkward staying at the place that you work everyday? As for the scenery it sounds beautiful and I love what you are doing for them!